You know how when kids learn things like gerund phrases, past participial phrases, predicate adjectives, and how to diagram sentences they ask questions like, "Why the heck do I have to learn this? When will I EVER need to know this stuff???" Truthfully, sometimes I really don't have a super solid answer. I mean, I haven't diagrammed a sentence since high school and I can't imagine I'll need to soon (well, except to teach it). And the pages of worksheets they have to do don't always seem that helpful in everyday life or for everyday writing. The reality is that they're learning this stuff so they can become better writers, so that their sentences follow proper form and they know when to use a comma, but getting from worksheets to real writing isn't always a logical, smooth transition, right? Fix It! 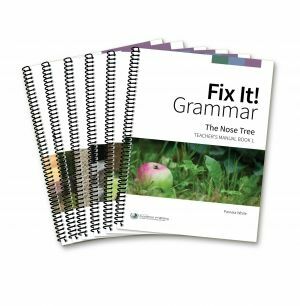 Grammar by the Institute for Excellence in Writing (IEW) takes a new approach to teaching grammar and, lo and behold, as soon as we began using the program the "why" questions ceased. Fit It! Grammar teaches grammar with a "real life" approach, instead of endless worksheets grammar is taught and reinforced through a long story, one or two sentences at a time. Proper grammar and punctuation is modeled throughout the book, teaching students to think about their writing and learn how to apply grammar rules to their work. The lessons are done daily, which is great for reinforcement and creating new writing habits. IEW offers a Placement Test for their six book Fix It! Grammar series. Adam (13) and Kaden (11) appeared to be a good fit for Frog Prince, or Just Deserts [Book 3], after taking the placement test and began at that level. Fix It! Grammar Frog Prince, or Just Deserts [Student Book 3] and Fix It Grammar! Frog Prince, or Just Deserts [Teacher's Manual Book 3] both arrived in the mail for this review. Both books are 8.5" by 11" spiral bound books, the student book contains 130 pages and the teacher's manual contains 262. The student book contains a short weekly lesson and accompanying daily pages (33 weeks total), grammar cards printed on heavy cardstock, and a glossary. The teacher's manual contains the weekly lesson and daily pages with proper corrections and explanations, a scope and sequence page, and a grammar glossary. Monday morning we sat down at the kitchen table to begin. The boys each found an empty composition book to write their corrected story and vocabulary words in, to be added to each day as they progressed through the lessons. They then cut out the grammar cards for the week. We discussed the grammar cards and went over the "Learn It" lesson section for the week. The boys then completed Day 1, correcting the sentence displayed in their book, and using a dictionary to look up the day's vocabulary work. Together we went over the Day 1 sentence, with the boys telling me what they felt needed to be edited and why, and me either agreeing or disagreeing based on the information in the teacher's book, and explaining why they were right or not. Days 2 through 4 were done independently by the boys. Each day after they'd done their editing we'd sit down and go over their work and discuss their mistakes. After their sentences were corrected they'd copy them into their composition books. Each weekly segment contains work for four days, with Day 1 containing the lesson. Day 1 tends to take about 10-15 minutes to go over the lesson, each days sentence work takes about 5-10 minutes for the boys to do their editing and another 5-10 minutes to go over the sentences together, most of that time spent discussing the edits and the applicable rules. Because the lessons are so short the boys don't feel overwhelmed or bored, in fact quite the opposite is true as they ask to do Fix It! Grammar every day. The story "Frog Prince, or Just Deserts" is really fun and interesting. I haven't read ahead in the lessons so I can't tell you what happens, but at least one of the boys has read the entire story. And, yes, "deserts" is the correct word ... the title is an intentional pun. The teacher's manual contains all the lessons and daily corrections, with explanations. The explanations are very thorough and very helpful. While the boys began at Book 3, the third book in the series of six, and are doing fine in it we really could have begun at Book 2, and I think the added focus on the material covered in Book 2 would have been good for them - the books build on each other and the background of the material taught earlier would have been nothing but beneficial. The books aren't age specific, but work within an age range and I think the placement test is imperative. If you take a look at the other TOS Crew reviews you'll see that Book 1 can, and is, be used with kids from grades 3 to 9. Here's the thing ... the boys are really getting this. It makes so much sense to them, and to me. They've gotten a solid grasp on main and dependent clauses and are seeing prepositional phrases in a whole new light (it's really nice to take them out of the worksheet and find them in real sentences). Because the days' work is so quick they aren't bored and ask every day to do Fix It! Grammar. Kaden says this is his favorite subject/book in school. Yes, grammar is his favorite subject. That's pretty cool. From Kaden: Fix It! Grammar is fun and easy (a little). I am very pleased with this program. We will be continuing with it through the school year, something the boys were very happy to hear, and I expect this series to become a part of our regular curriculum, moving on to Book 4 next year. Overall, I'd say we're thrilled and highly recommend this program. 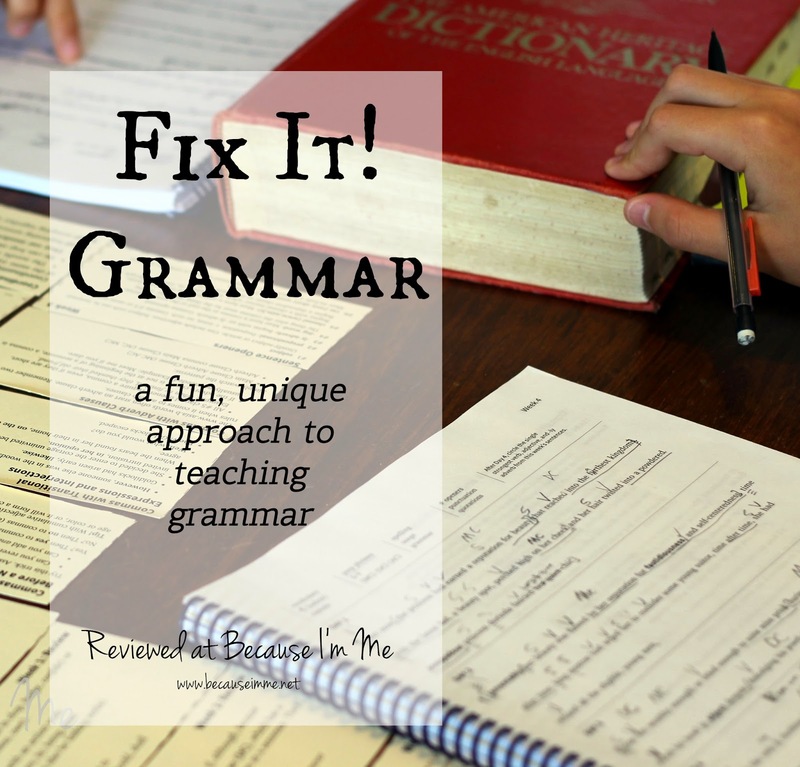 If you're looking for an easy to understand fun alternative to textbook grammar, or a supplement to your textbook program, I strongly suggest giving Fix It! Grammar a try. Fix It! Grammar Frog Prince, or Just Deserts [Student Book 3] is available from Excellence in Writing for $15.00 and Fix It! Grammar Frog Prince, or Just Deserts [Teachers Manual Book 3] is available for $19.00. The other five levels in the series are available as well. The series is geared toward kids in 3rd through 12th grades.